Tecblue explains how its new three and six-room plug and play system packages promises effortless high quality-listening for your customers and greater rewards for you. If you’re resigned to the thin margins of the leading multi-room audio brand, Tecblu is offering a rewarding alternative. By uniting the talents of VSSL’s multi-zone player/amplifiers with high-performance NuVo in-ceiling speakers in custom bundles, the specialist online supplier will help you to deliver an easy, discreet, high quality whole-house audio experience at a far more competitive price – but with industry-leading margins built-in. 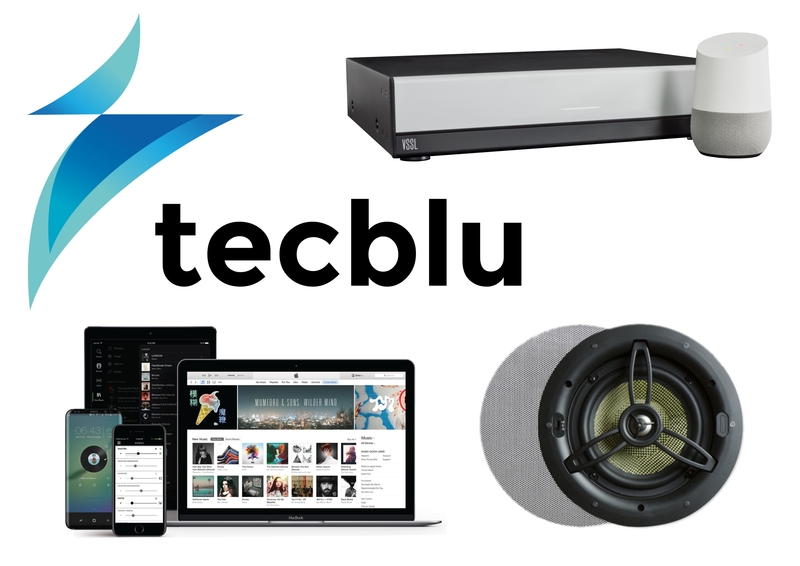 Buying the new range of three and six-room system bundles direct from Tecblu gives you up to four times the return on your multi-room audio installs, yet the installation itself is designed to be as easy as plug and play. Simply hook up VSSL’s A.6 (50W x six zone) or A.3 (50W x three zone) player/amplifiers to a router and connect stereo pairs of discreet NuVo in-ceiling speakers in each zone at speaker line level. Matrixed inputs and outputs on the A.6 or A.3 will let your customers stream music from six different sources to six different rooms, or three different sources to three different rooms respectively. VSSL is the first multi-zone music system that works peer-to-peer like a Bluetooth speaker. Using proprietary Native Streaming capability, your customers decide what to play in any room through the native apps on their phones, tablets and laptops, rather than having to navigate to alien third party apps. Hit the airplay button on an iPhone, for instance, select the room, and listen to full-range audio from, say, Apple Music, iPlayer, Netflix, Amazon Prime. Alternatively, cast from an Android phone for a similarly responsive experience. Not only will your customers enjoy quicker access to their music, VSSL’s native integration with Google Home enables sleek voice control of the system as well, so in up to six zones they can simply say “Ok Google, play music”. Discreet in-ceiling speakers from multi-room music pioneer NuVo are the perfect audio partner for VSSL’s hi-fi quality sound. Tecblu’s bundles offer you a mix of affordable speaker options to help you tailor the sound perfectly for any space. Deploy various configurations of NuVo’s Series 2 models for everyday listening or Series 6 speakers for more audiophile applications. In the time it takes to install the multi-room market leader, you’re able to deliver Tecblu’s versatile multi-room audio to your customers, and significantly boost your earning power in the process.